1) Last weekend was cold and snowy, so my little family stayed home and ate some delicious homemade Veggie Soup. I love a good hot soup or chili on cold snow days. It's so comforting! 2) While being stuck inside all weekend from the snow and my ear infection, Justin and I started watching Riverdale on Netflix. It's so hard to find a new show that we actually like, but we like this one. Have you watched it? Do you have any Netflix recommendations? 3) My single Red Tulip is out in full bloom and beautiful birds have been to the bird feeder several times a day. It gives my heart hope that Spring is almost here for good. I'm so over this cold weather. They are forecasting snow again for Monday, but I know this cold weather can't last forever. 4) Raylan had his 4 year old shots and did so well with them, so that called for a treat. 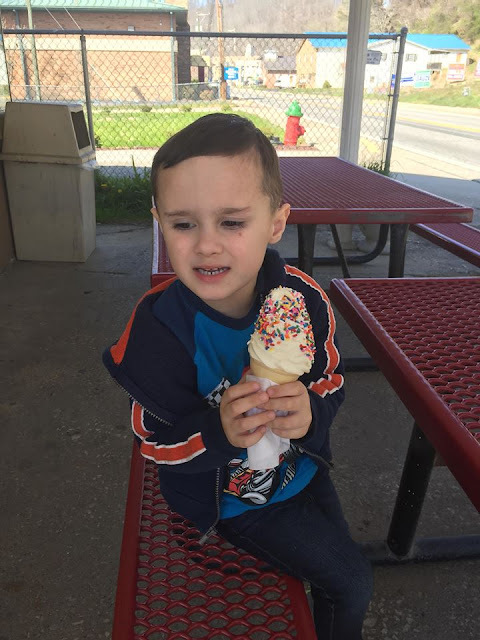 I took him out on an ice cream date after the shots. He was a happy camper then. 5) I'm in search for a new book to read. What is everyone reading lately? This week's featured blogger is Kasey from Days of a Wife. Kasey is a Christian, wife, teacher and fashion enthusiast. She loves home decor, scrapbooking, cooking and disney. Kasey has a great blog. Please stop by and say hello to her.